Inspired by this MSO question. 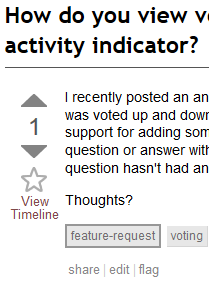 This tiny userscript will add a link to the timeline for any post, just below the "favorite question" star button. Feel free to submit any bugs, feature requests and comments on the script. Don't use unsafeWindow, this will break in Chrome and will not even work in Firefox+Greasemonkey if the effective @grant changes. The regex match needs to be more robust, to account for all legal characters in the URL, and for anchors. Use injection so that the script will work on most userscript-capable browsers (Chrome, Firefox, Opera, Safari, etc.). View the source at GitHub Gist. // @description Adds links to posts to always show history and links to questions to show the Timeline". // @history     1.3 SE changed Timelines. Answers were separated out from the question timeline. Not the answer you're looking for? Browse other questions tagged script timeline .